The forces of digital disruption have empowered consumers and inverted the power relationship between buyers and sellers. Competitive advantages based on manufacturing, distribution, and IT are no longer sustainable. Customer loyalty has all but disappeared; buyers can and will shift their allegiance immediately if disappointed. 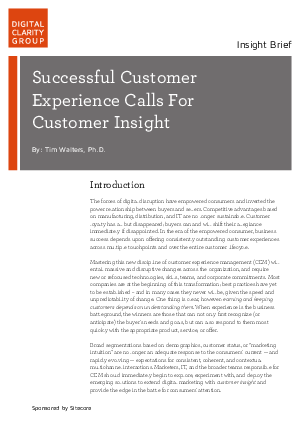 In the era of the empowered consumer, business success depends upon offering consistently outstanding customer experiences across multiple touchpoints and over the entire customer lifecycle.